Without doubt, the best way to create a true security culture within your company is through IT security awareness training. This shows your employees learn how to identify and avoid cyber security risks, and provides practical and comprehensible illustrations of how important it is to sensitively handle data. Our modular and specific IT security awareness measures help you and your employees to become more aware of data and IT systems. You will learn how to use sensitive devices, such as mobile devices, properly. With a better understanding of the security issues associated with them, you will better protect your IT and IT systems while safeguarding your assets. With regard to the recognition of risks, during the awareness training the participants learn which defensive measures are best for each respective case. This can be used to prevent potential IT damage, such as data loss. After an IT emergency exercise, you and your staff will be able to identify and respond to security incidents faster and more appropriately. Knowing how to correctly deal with IT security also means minimising IT failures while at the same time meeting compliance requirements and building synergies between existing security measures. In addition to improved protection of your assets, you will also achieve greater protection against data theft and sabotage. The protection of critical business processes is also significantly increased because users know about the security risks. Our offer will make sure your employees take information security seriously. Your security mechanisms and measures will be seen as enablers and not as prevention, and your business will be protected against major damage. 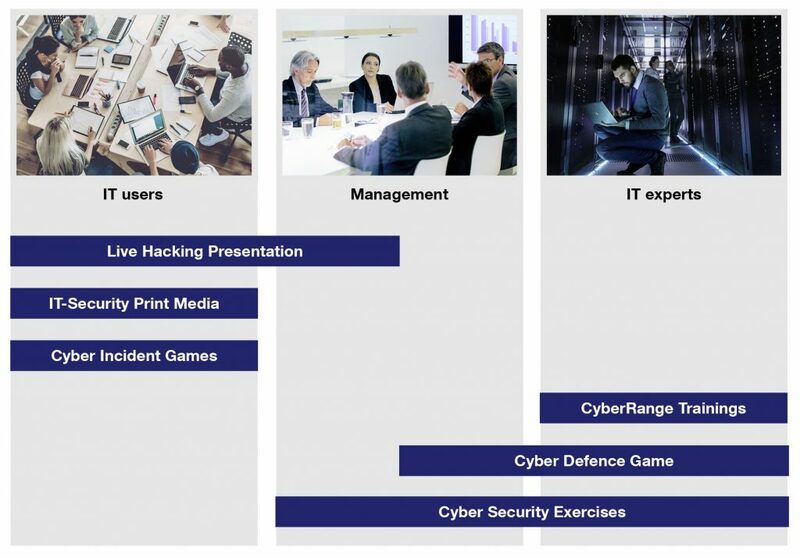 Airbus CyberSecurity will do this by providing a concept tailored to your IT users, management and IT professionals to meet your organisation-specific needs. Our target group-oriented approach is modular and can be ideally integrated into existing campaigns and ongoing measures. We are happy to assist you with the development of new campaigns and solutions.